The Vesper Sparrow is generally less shy than many of the grassland sparrows, and can often be seen singing from the highest perch in its territory. They are named after their believed tendency to sing most gloriously during the vesper (evening) hours, although they will sing at any hour of the day. They are very fond of dust baths, often using the bare soil of a field or a dirt road. Habitat: Can be found in many open dryland habitats, including roadside ditches, prairies, grassy or weedy fields, and stubble fields. Diet: Insects and seeds. Primarily feeds on insects during the summer, along with spiders and other small invertebrates. Feeds heavily on seeds in the winter. Behavior: Nearly always forages on the ground, often in small flocks. Migration: Summers throughout much of the United States and southern Canada. Winters in the southern U.S. and points south. Conservation Status: Vesper Sparrows declined precipitously in the eastern United States during the 20th century, but that is most likely due to the reforestation of forest lands that were cut or used for agricultural near the start of the 20th century. Their numbers were likely artificially high in the East during the years with low forest cover, but are declining as forest lands return. They are still widespread and common in the West. Overall, numbers may be showing some decline, but there's no substantial threat to their overall population. 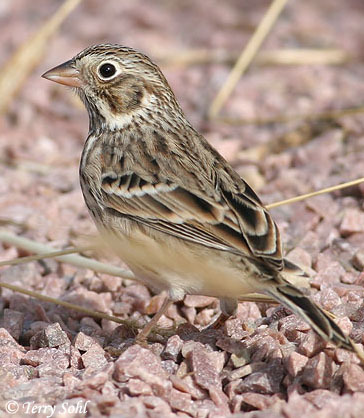 The IUCN considers the Vesper Sparrow to be a species of "Least Concern". Additional Photos: Click on the image chips or text links below for additional, higher-resolution Vesper Sparrow photos. South Dakota Status: Common summer resident in suitable habitat throughout the state. Accidental in winter.